1. What is wrong if my door will only open about an inch, or two, and then stops? You may have a broken spring. We suggest you contact our office to arrange a service call and we will send one of our qualified technicians to replace it. If you have 2 springs on your door and one is broken, it is recommended that you replace both springs. 2. How come my door starts to close and then goes back up and the lights on my garage door opener flash? AND/OR How come my door closes if I push and hold the button on the wall? If Chamberlain/Lift Master/ Steelcraft/Craftsman/Wayne Dalton manufactured your operator, you may have a problem with your photocells. These are the small black boxes positioned near the bottom of the track on either side of the opening. Each photocell has an LED light. Those lights should be solid. If either one is flashing or not lit, that indicates they are out of alignment or something is blocking the beam that travels across the opening. Remove the item, or if nothing is blocking them, move the photocell slowly until the LED is a solid light. Your door should now close. If it still doesn’t close, you should contact our office to arrange a service call and we will send one of our qualified technicians to determine the problem. 3. My 'remote control' won't work. What could be wrong? You may have your “lock-out” on. Check the wall button inside the garage. On newer Lift Master operators there will be a small light, in the middle of the large white button. That light should be solid – if it is flashing, push and hold the lock button beneath it and your remote should now work. On older operators there should be a switch labelled “lock”. If there is a red light lit on your control panel it is indicating that it has been turned on. Switch that to the off position and your “remote” should work. If it still doesn’t work, we recommend you bring your “remote” into our office and we can have a look at it, or contact our office to arrange a service call and we will send one of our qualified technicians to determine the problem. 4. What if I have one 'remote control' for the garage door opener, but I need another? Or What if I have a garage door opener but I don't have a remote for it? All garage door openers have a model/serial number on the ID Label on the overhead operator head. Please click here for instructions on how to locate it. Once you have located the Model number, please call our office, or come into the office, for further assistance. 5. How come my opener hums but will not open my door? 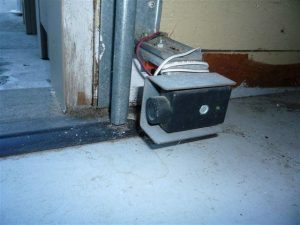 If the opener makes a humming sound, for at least 10 seconds, as if the electric motor is running, but the door does not move, then the opener may have damaged or worn gears inside the overhead motor case. Any damage to the gears will be readily apparent by the presence of “white fluff” inside the case. Please call our office to arrange a service call. 6. My door comes down about ¾ of the way and then goes back up. What is wrong? Try rubbing paraffin wax on to the inside of the wood garage door trim (jamb). In wet weather the wood will absorb water, causing it to swell and the door can bind on this swollen wood, causing it to reverse. If reversing persists, please call our office and we would be happy to arrange a service call for you. 7. What is wrong if my opener runs and the traveller moves but the door won't open/close? The traveller needs to be reconnected. Please contact our office for instructions. 8. Why does my door open/close intermittently on its own? Check the location of all the remote controls. They should be kept on the car visor, or in the console, with lots of free space. This way the buttons can’t get pressed by mistake. If this doesn’t help, it can also be a loose wire either at the operator head or the wall control, or possibly a broken wire. 9. My opener is very noisy. Can anything be done? We can provide you with special isolators, which may help with this. 10. How do I reprogram my keypad? There are many brands of keypads. If you contact our office, we should be able to assist you. 11. Can I put photocells on my existing opener? Photocells are available for many, but not all, older openers. Contact our office to see if your opener is adaptable. 12. What is wrong if my opener does not work at all and no lights come on when I activate the unit? Check for proper power supply to unit. If there is power to the unit and there is still a problem, call our office to arrange a service call. 13. How come my remote has such short range? Check your battery, in your remote control. Transmitters (remotes) are sensitive to voltage and require batteries with full voltage to operate with full range. Do not use rechargeable batteries. Our showroom has a full supply of 9V, 12V and lithium batteries available. Bring your transmitter to us and we would be happy to change your battery for you. 14. Why does my door close completely and then immediately open? Check for obstructions under the door. If there is nothing under the door, your machine’s “forces or limits” may need adjusting. Call our office to arrange a service call. 15. Why do my opener's light bulbs keep burning out? Keep in mind that you must use a “rough service” bulb. Check your opener for the proper wattage to use. Please note – use only incandescent light bulbs – not CFL bulbs (compact fluorescent). 16. Do I need to reinforce my door if I am installing an electric garage door opener? Yes! All steel garage doors should be reinforced where the opener is attached to it. We can supply “operator plates” of various sizes to accommodate this. 17. 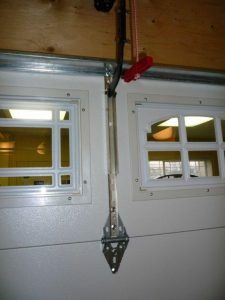 How much headroom do I need to install a garage door? 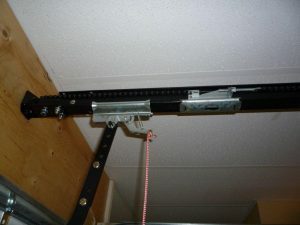 You normally require 12″ of headroom to install a residential overhead door with standard lift torsion spring hardware. You do require an additional 2″ to accommodate the installation of an electric opener. Call our office, to clarify. We can also arrange to come out to your home or job site and go over these details with you. 18. I do not have the required amount of headroom. Is there anything I can do? Yes! Different types of low headroom hardware are now available. You can install a door and opener in as little as 6″ of headroom using special “double track” hardware. Consult our office for details regarding all types of low headroom hardware. 19. I do not have a standard size opening. Can you get a door to fit? Yes! There is a very wide range of standard sizes available. We can also special order many products in custom two inch increments. Almost anything is possible! Consult our office for details regarding custom sizes. 20. There is a power outage and I need to get my vehicle out of the garage. 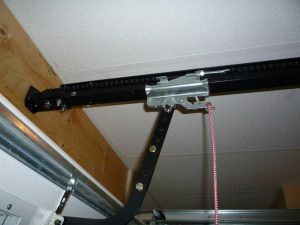 If your electric opener is mounted above the center of your garage door and hangs from the ceiling, there will normally be a white or red “disconnect” cord hanging down. If you pull down on this cord, the 2 sections of the traveller will disconnect. This will allow you to lift up the door, manually, to the open position. Please be careful not to get your fingers caught between the sections, when you are handling the door manually and also to watch that the door stays in the open position. Some doors will hang down into the opening. If your opener is not a ceiling mounted opener, please contact our office for disconnect instructions, or to arrange a service call. 21. 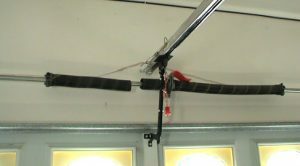 How can I reconnect my garage door after emergency disconnect? Normally, activating the opener with a transmitter, or a wall button, and running the door to the up or down position, will reconnect the door. If you are unable to reconnect, please call our office for further instructions. 22. How do I program my vehicle 'HomeLink' system? Press and hold the 2 outside buttons, together, on your vehicle “HomeLink” console, until the LED light blinks rapidly. Then release both buttons. Press and hold one of the 3 available buttons, on the “HomeLink” console and at the same time, repeatedly press the button on your working garage door opener remote/transmitter, until the LED light, on the console, blinks rapidly. Then release both buttons. “Security +” or “Rolling Code” technology and proceed to the next step. Locate your “Smart”/Program button at the rear of the operator head, on the ceiling of the garage. Press and release the “Smart”/Program button and then within 20 seconds, press and release the programmed button on your “HomeLink” console, in your vehicle. The system should now be programmed. If these steps don’t work – please change the battery in your transmitter/remote and/or turn the vehicle ignition on. Then repeat the above steps. To program additional remotes, omit Step (1) and begin with Step (2). If you are unable to make your “HomeLink” system work, please contact our office for further instructions/advice, or to arrange a service call.